A really cool truck popped up on Bring A Trailer today that many people in the states have probably never seen before. 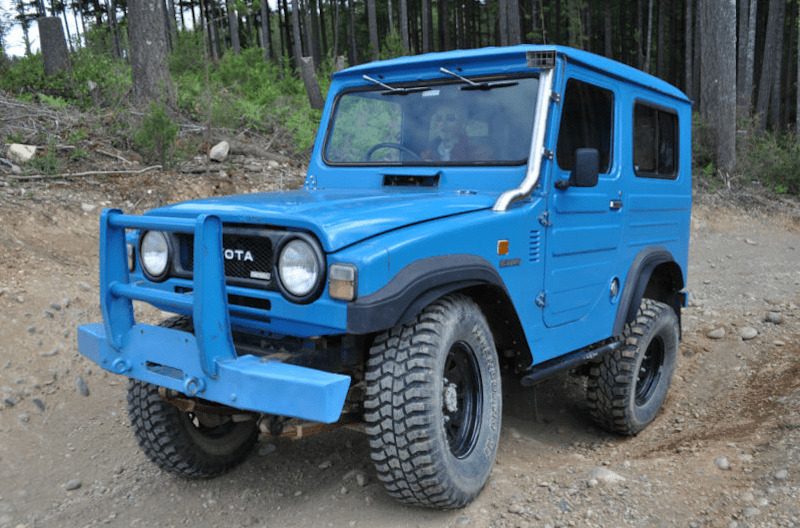 It’s a 1982 Toyota Blizzard, which is basiaa Daihatsu 4WD similar to a Land Cruiser, but in a Samurai sized package. It can negotiate tight trails, park just about anywhere, and thanks to Toyota’s 2.2-liter diesel motor, can get upwards of 32 mpg in the city. In addition to appearing fairly clean with little rust, this tiny truck has some cool modifications that will let it get just about anywhere you could want to go. 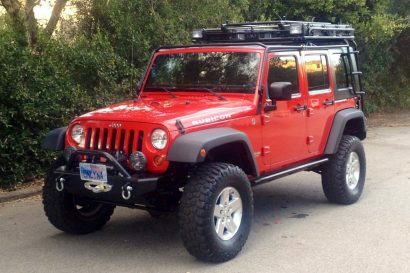 A 2″ suspension lift with 1.5″ body lift combine to allow for a set of 31″ mud terrain tires and an improved amount of clearance. Additionally an aftermarket turbo provides the perfect amount of power for this new setup. 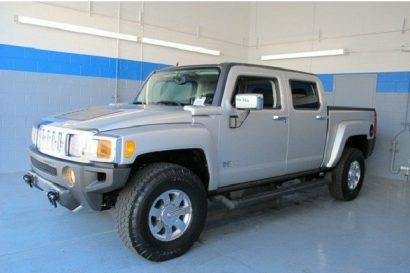 Other upgrades include front disc brakes, a 5-speed transmission, custom rock sliders, a snorkel, and a winch ready front bull bar. Has an aluminum 15-gallon second fuel tank installed but not plumbed. Hook it up and go 600+ miles between fill ups! This Blizzard is the rarer “Deluxe” version (still has Deluxe badging on the truck, too) which means the rig was optioned with front and rear mud flaps, fender flares, upgraded dash, locking fuel cap, automatic glow plug warming system and more. Gotta love that swept door design. So unique! New battery. She fires right up with minimal smoke and runs beautifully. No oil leaks. Everything is good and tight and functions as it should. 162,541 miles is only 5240 miles per year! 3″ turbo exhaust. The rig is peppy! It has the superior 5-speed manual transmission that replaced the original 4-speed and she sits on 65mph all day. 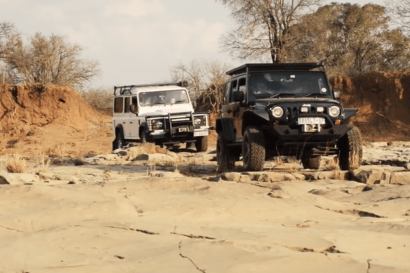 A 2H/4H/4L transfer case handles 4WD duties. Has 2″ suspension lift and 1.5″ body lift. Front disc brakes and rear drums work great. 31×10.5 mud terrain tires ride on 15″ Blizzard-spec wheels. The stainless steel snorkel is a work of art. Extremely rare ORIGINAL factory Toyota Blizzard repair manual comes with the truck! PLUS, a factory Toyota engine repair manual for the L/2L engine. 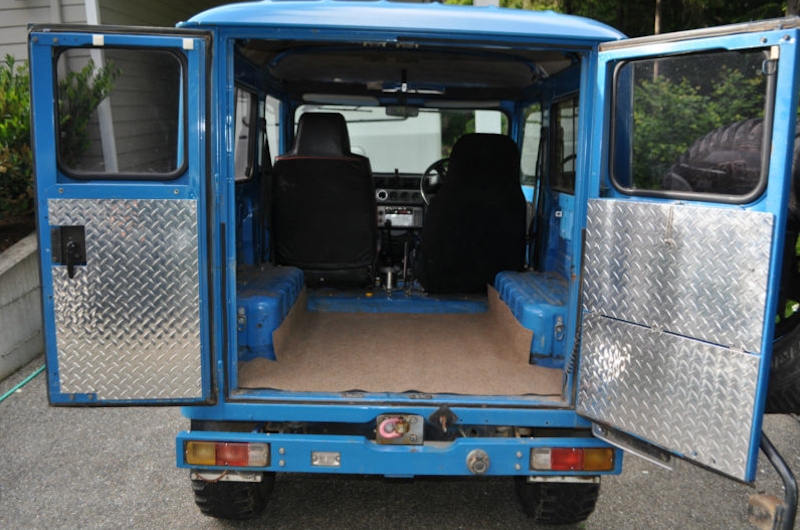 The roof is like the FJ40, it extends upward for extra headroom. There are mini-LED lights on the side and center support rails which add a ton of bright lighting to the interior. Interior storage shelf above windshield can hold a CB/ham radio, maps, etc and also has speaker cutouts. Original front carpet is in great condition and snaps to the floorboards, a unique system. Cargo area has new all-weather carpet. Air conditioning consists of opening that totally unique in-dash vent door and letting in a blast of cool air! It works incredibly well! Gauges in top pod are (from left) turbo boost, amps, temp, fuel. Main console: speed and tachometer. Front winch-ready bull bar with two recovery points. Rear pintle hook. Unique stand-alone reverse light in rear bumper. Swing out spare tire carrier; spare can be padlocked for security.